Whether it’s an enchanting beach cottage or a sylvan lakeside retreat, a waterfront home blends in with the beauty of its natural surroundings. The end results are lovely to behold, but building and renovating waterfront homes often involves unique design challenges. Waterfront homes are subject nature’s whims, like winds, flooding, and craggy lots. It is up to the architect to address these challenges while still designing waterfront homes that meet their clients’ tastes, wants, and needs. Learn about the challenges posed when designing homes along the coastline, and the unique solutions crafted by Cardello Architects. Coastal waterfront homes are exposed to extreme weather, like the high winds and flood-inducing rains of hurricanes, and other challenges posed by nature, like shoreline erosion. Careful thought and planning must go into the design of the home’s foundation, its structure, and the materials used to build or renovate it. Create a sturdy, durable foundation: Assess soil type, stability, and potential for erosion when designing a solid foundation that can endure regular wear and tear as well as the potential of the natural forces it is subjected to. Incorporate special structure requirements: Designing a waterfront home, especially on the coast, may require special structural components like special nailing and bracing and frame-strengthening “shear walls” to withstand high winds. Include storm-resistant windows and shutters: To protect the interior of the home from extreme wind and storm-blown debris, incorporate reinforced windows and storm shutters. Choose the right materials: In general, choose materials that can tolerate exposure to saltwater and salt air, as well as those that are naturally resistant to bad weather, like copper and decay-resistant woods. The home pictured above is an example of a waterfront renovation that required changes to the foundation. Namely, the quaint Rowayton beach retreat required a small lift to protect it from Mother Nature’s floods. The resulting dwelling is home to fantastic seaside views and multiple areas for outdoor living. Zoning and Federal Emergency Management Agency (FEMA) regulations often play a role in the design of waterfront homes. In addition to being sturdily built, foundations may also require a “lift” to protect the house from floodwaters. Or, the home design may incorporate elevated piers to allow flood waters to flow below the house without damaging it structurally. Designing waterfront homes in Fairfield County often means putting these special considerations into foundation plans. Cardello Architects has worked on a number of homes where a lift was necessary, including the residence pictured above. 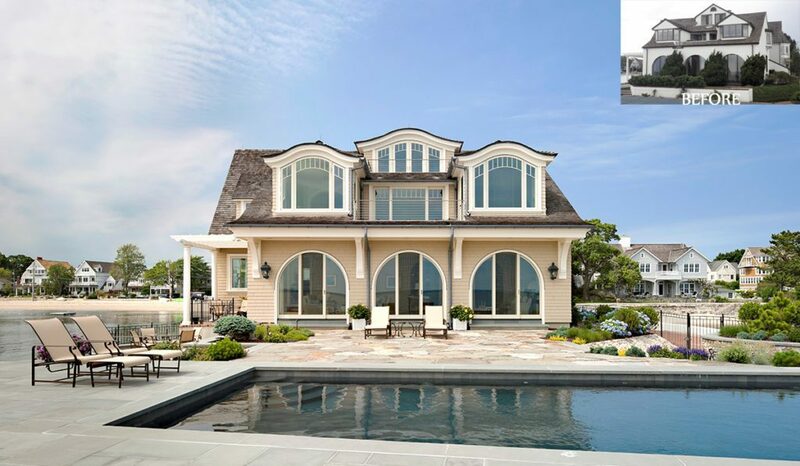 The home, located in the Noroton Bay area of Darien, Conn., had undergone a minor renovation only to be destroyed by Hurricane Sandy in 2012. Cardello Architects designed the new dwelling from scratch and raised the home to meet current FEMA regulations while also granting the homeowners peace of mind that their new home could weather future storms. Details like natural stone steps and terraces help the raised foundation and three-story dwelling blend in with its surroundings. 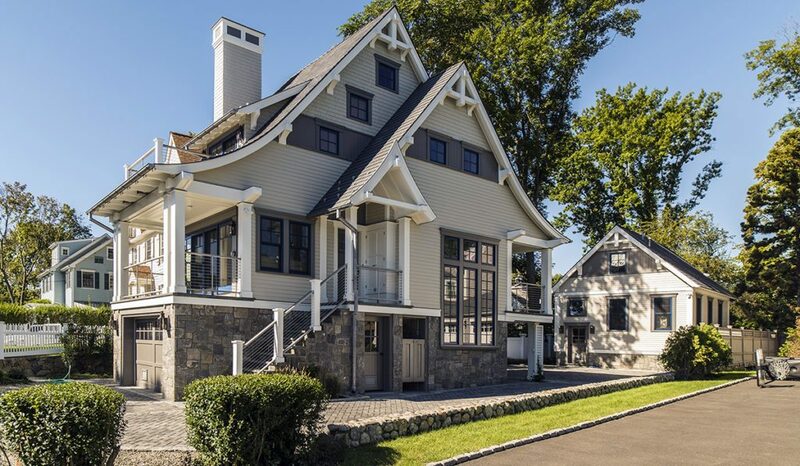 These cottages in the Rowayton neighborhood of Norwalk, Conn., also showcase waterfront design that required heightened foundations. The original dwellings were destroyed by Hurricane Sandy. Cardello Architects was tasked with designing cottages that not only met flood zone restrictions, but were also architecturally appropriate to the neighborhood. Zoning regulations meant the design had to fit the tiny existing footprints, so the cottages were lifted. The rear building was renovated and the front building was designed from a clean slate. Despite the small footprint, the living space is comfortable and roomy, including two bedrooms, two full baths, a large laundry and storage room, and a spacious kitchen and family room with two balconies to enjoy the view of nearby Farm Creek. Another unique challenge posed when designing waterfront homes is the size or condition of the property. Coastal land can be craggy and crowded, or long and narrow strips of land along the sea. This home built on a peninsula in the Belle Island area of Rowayton sat atop a pile of rocks. 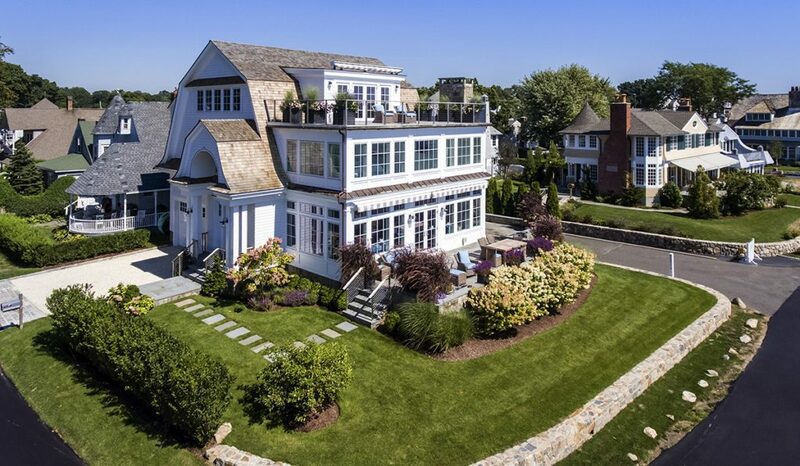 The homeowners wanted to stabilize the dwelling, as it is quite exposed to Long Island Sound. Cardello Architects designed a top-to-bottom renovation, stripping the house and adding new windows, doors, siding, and trim. A slightly sweeping roofline and eyebrow dormers were added to give the home character. Shortly after the renovation was completed, the house stood strong against the three-foot waves that rolled in, courtesy of Hurricane Irene. Designing the Darien home above required some creative thinking, as the property was essentially a long, narrow piece of land with coastline on two sides. Several variances were required to build a house that could take advantage of the spectacular views. The roadside portion of the floor plan is used for circulation and function, while the waterside features the main living spaces. The end result is a floor plan that translates well to many waterfront homes. At Cardello Architects, we pride ourselves on our cultivating architectural styles and designs that meet your needs. Our residential services range from consultation and design development to bidding and construction administration. If you’d like to learn more about Cardello Architects, contact us to discuss your dream home today.